Ok, so I know I just got and reviewed this sweater, but I loooove this sweater made for warm weather. Of course if it’s really hot, there’s no need for a sweater. But for a city like SF where there are micro-climates, layering is key and this sweater is the perfect little cover-up for mild days. This would also work for those who easily get cold in even slightly air conditioned rooms (though if you’re working in a cold office environment you’ll probably want the cotton sweater below). This sweater also works for those who want a bit of a cover-up from the summer sun but don’t want to slather on SPF. I reviewed this here and it’s my favorite 100% cotton sweater (especially for those who are on the petite side). This sweater is made from a good thick cotton knit that’ll keep you warm but not too warm. I liked this sweater so much I got two of them (one in ochre and one in navy) and I find I use them both a lot. They’re especially useful for me in air conditioned environments. When the temperatures start to dip, I look forward to breaking out my cashmere sweaters. And my favorite cashmere sweater from Everlane is the waffle knit square crew (reviewed here). I have two of these as well: one in navy from 2017 and one in oatmeal from 2018. The cashmere of these sweaters feel more substantial and quality than those of the $100 cashmere sweaters and I think it’s definitely worth the $55 price difference between the two sweaters. Also the waffle knit texture just adds more interest to every outfit you wear it with. I also love the split side detail (for easy french tucking) and the split sleeve detail. If you prefer more of a 90’s sweater look, the cashmere rib round crew (reviewed here) is also a great textured cashmere sweater. Even though I disliked the mix of nylon with the alpaca in this sweater (which I talked about in my review of it here), I kind of get it because 1) 100% alpaca is darn expensive and 2) 100% alpaca is hot as heck. Having tried one from Lauren Manoogian, a thick 100% alpaca knit is too hot for California’s winters and probably too hot to wear indoors. So this makes the Everlane alpaca blend sweater the perfect one for cold weather (though I’m sure for really cold and or/windy weather you’re going to want to layer this with a coat or jacket) without being too hot. Anyway as we head into spring and then summer, sweaters will probably not be on your mind. But I felt like since Everlane’s sweater selection is so good right now, I would be remiss not to take the opportunity to write a post like this. Anyone else have multiple Everlane sweaters? About 90% of all my sweaters are Everlane and it seems like they’re getting better and better every year! Hi guys and it’s been awhile with my Everlane reviews but here’s a fresh new one (I pushed up this new review since I got a lot of interest about this sweater on Insta but the posts after this will be back to those written pre-birth). 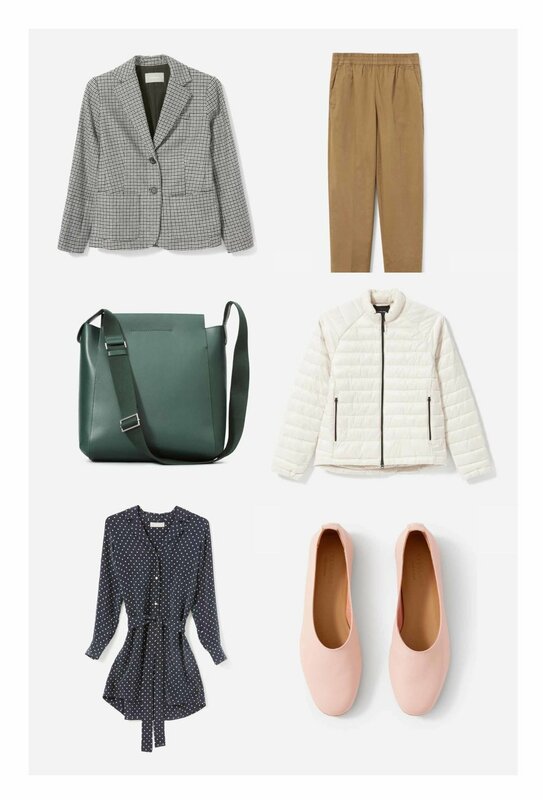 Since I utterly failed at my one new item per month resolution in March, I just let everything slide and ordered two new items from Everlane in the last week of March (it’s like when you blow your diet so then you eat ALL THE FOOD). But oh it felt so good to scratch my Everlane itch and get this cotton linen v-neck sweater and the mini form bag. And it felt even better when I realized both items were clear winners for me (ah, there’s that Everlane that I know and love)! First a note on sizing, I got this sweater in a small (my regular Everlane size) and I would say it fits TTS. The sweater is boxy and cropped, which is perfect for my post-pregnancy 5’4” frame (I love that it flows away from the body to hide my remaining belly pooch). It’s also the perfect loose spring/summer sweater to tuck into some high-rise bottoms (I can’t wait until I can fit into my jeans again). What I really love about this sweater though is the wonderful texture of the linen cotton combo knit. The linen makes it more lightweight and slightly rougher than a 100% cotton sweater. The texture isn’t soft and smooth but I wouldn’t say it’s itchy either. When you compare this to the the Everlane’s soft cotton square crew (reviewed here), this linen cotton version has a looser weave and is a lot lighter in weight. But both have a very similar boxy cropped shape with wide sleeves (except the cotton sweaters are crewnecks while the cotton linen blend sweaters are v-necks). I wore this cotton linen sweater in 73 degree weather and it was the perfect light cover-up and didn’t cause any overheating. The cotton sweater would have definitely been too warm. My only concern is how this sweater will do over time and with multiple washings. The instructions say to handwash this, which I’m not a fan of doing. But I’d be willing to wash this sweater by hand because I love it that much. I’ll update this review after I wash it and let you know how it fares. So if you’re looking for a good hot weather cover-up or a sweater for those slightly cooler summer days, I highly recommend this cotton linen blend sweater. And I definitely recommend getting it in this sand color (which is more cream than beige) since the texture will elevate your all neutral look (because you know that’s going to be the trend of the season). I have to say this is one of the better sweaters to come around from Everlane in recent times and I have a feeling it’ll go fast (the crewneck version is already sold out in the smaller sizes). Has anyone else tried this cotton linen sweater and what did you think? Let me put it this way, if I were to liken these shoes to cars, the Everlane Day Glove is like a Honda while the Martiniano Glove is like a Rolls Royce. But let me get specific. The biggest difference between the two, as you can see from the pictures alone is the kind of leather they use for the shoe. The Martiniano’s are handmade (in Argentina) from a beautiful, supple, slightly shiny and totally malleable Italian kid leather. It really does feel like one of those luxurious thin leather gloves that’s normally worn on your hands. In comparison the leather of the Everlane Day Glove is much thicker, stiffer, and duller (they say buttery soft in their product description but that is a lie when compared to the Martinianos). The difference in the leather leads to a difference in fit. I had trouble with the Everlane Day Glove (read all about it here) and even with a week of consistent wear, wasn’t able to break them in. And instead I got a blister on the heel and a few pain points at the top of my foot. I’ve been wearing the Martinianos around the house and have had zero issues and there is no breaking in period because the leather is so soft and malleable. The top of the shoe neither digs in, nor do I have any rubbing at the heel. This is truly a dream of a shoe to wear. The Martiniano shoes run true to size and I got my usual size 8 (or in this case a 38 and fyi I’m the same size for Everlane as well) and it fit perfectly. The Martiniano glove shoes are made from all leather, including the sole, except for the stacked heel which is made out of wood. In comparison, the Everlane Day Glove has a rubber bottom that cannot be resoled and is slightly more inflexible than the leather soles. However, the leather soles of the Martinianos does mean the bottom is quite slippery and some Martiniano owners have highly recommended adding a rubber sole to the shoe. This means that the with the proper upkeep, you can resole your Martinianos for years to come. So which one did I keep? Ok before I lose all credibility here, I had every intention of keeping the Martiniano Glove shoes but when Totokaelo (where I bought these shoes from) gave me a 15% off coupon for messing up my order I decided that I would send them back repurchase them to get $65 off (that’s nothing to sneeze at). But I decided to hold off on repurchasing because I’m not too sure where these shoes will fit in with my new mommy lifestyle (yes they’re still practical flats that are uber comfy, but really am I going to be caring about my shoes when I’m in full mommy-mode? Will I fret about getting vomit or food on the beautiful leather tops? Will I even care about shoes when I’m sleep deprived? I don’t know so I have to see before spending $400 on shoes). Also I would go over my quota of one closet addition per month if I had kept these shoes (though there’s nothing that says I can’t buy them in the future as an addition for another month). And finally, if I do re-buy these Martiniano flats, I kind of want them in a color other than black (these burgundy ones are super dreamy though I wouldn’t be getting a discount so I don’t know, we’ll see. Or I’ll wait until Totokaelo comes up with other colors—they just released an orange one that I’m not a fan of). But here’s my final advice for people who are trying to decide between the Everlane ones and the Martiniano glove shoes: if you’re looking for a practical flat that doesn’t break the bank, you have normal to narrow feet with a low profile and/or you’re willing to do the work to break them in then I think you should definitely go for the Everlane ones. At almost 1/4th the price of the Martiniano shoes, the Everlane one is a great value and essentially does the same thing in a similar looking shoe: gets you from A to B (I guess this is the same argument you can make when deciding between a Honda and a Rolls Royce lol). But of course if you have the funds to indulge, the commitment to keep them up, and want a shoe that’ll last and last then the Martiniano glove shoe is the luxury shoe for you. P.S. If you’re feeling lucky, sometimes TheRealReal has a preowned Martiniano glove shoe. Check here if they currently have any in your size (I’ve been seriously stalking this feed for months and so far no size 38s have shown up, though I’ve seen 37s and 39s!). P.P.S I snagged a pair of the heeled Martiniano Glove shoes on eBay (for $95!!) so I’ll be reviewing those too (though I still really want a pair of these flats as well). So I rarely see other bloggers talk about what happens to their gifted items. I guess we are supposed to assume that each piece that we raved about when we first got it, is still an amazing workhorse in our closet. But we all know that’s not true because that’s not true about most items that enter our wardrobe (gifted or not). Also I’m sure bloggers don’t want to look a gift-horse in the mouth (I had to look that idiom up to get it right and what an interesting phrase) and burn bridges with future sponsorship/gifts. Buuuut since I’m not looking for any sponsors or gifts this year I’m going to tell it to you straight: not all the gifts I got from Everlane were a winner. Here’s a list of things I was gifted and what were the winners and losers. Everlane Easy Chinos (reviewed here): These were easily my favorite pair of pants from Everlane and I wore them a ton. They made it to my most worn items of 2018 list as well as lowest cost per wear Everlane list. Can’t wait to wear them again post pregnancy! Polka dot shirt dress (reviewed here): I really love this dress and the cupro material, and the only reason why I stopped wearing it was because the baby bump was making it a tad too short. But again I plan to rock this once my body shrinks back to it’s normal size. Renew lightweight puffer (reviewed here): This was my last gifted item from Everlane and I’m glad I was able to try it out. I love how lightweight it is but still keeps me warm. I can no longer zip it up currently but that hasn’t stopped me from wearing it layered over sweaters or with a scarf. The Academy Blazer (reviewed here): As much as I wanted to love this blazer, I think I just have to admit I’m no longer a blazer-wearing person. Also the shorter style just isn’t as on trend or as cute as the oversized one. I sold this on eBay and kept the $65 to go towards my hospital bills (I was feeling a bit poor at the time so I sold a bunch of things to go towards the hospital bill). Short Sleeve Popover Shirt (reviewed here): As much as I liked the shirt in theory, I ended up not wearing it as much as I had hoped. I think in the end it reminded me too much of my Episcopalian school uniform (from when I was in K-5) and I never felt stylish in it. Also the collar kept getting makeup on it which is a pet peeve. Also sold it on eBay. 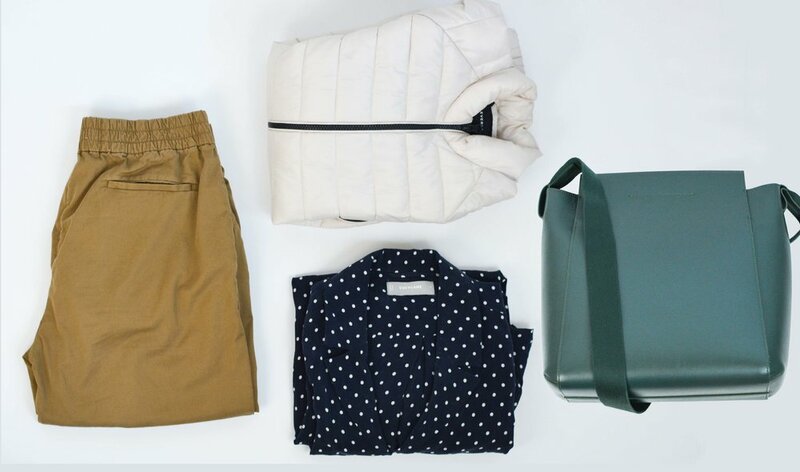 Form Bag (reviewed here): This was something I boldly asked Everlane for, without them asking me if I wanted anything that month. And I was super thrilled when they said yes. But I put it in this mixed bag category here because even though I still love it (love how it looks and how I can carry it), I find that I don’t wear it as often as I thought I would. It might be because I’m still sans baby so I can get away with carrying small bags (which I rather do since they’re lighter and don’t get in the way). I’m keeping it around since it’s a great mid-size bag and am hoping it would work as a minimal diaper bag. And I think that’s it. I was gifted about one item per month from about March to October, so a total of 7 items. I’m extremely grateful to have had this partnership, especially when I think about all the winner items I keep wearing on repeat (or will get to wear once baby comes). Currently I’m putting a hold on the partnership since I’m trying to decrease my clothing consumption and also because I don’t want to be buying things for my pregnant body, just in case I don’t wear them once my body settles back to its “regular” shape (in whatever form that’s going to be—I’m trying to keep expectations low lol). So I might hit them up later to see if they’d be interesting in partnering again, but if not that’s okay too. I’m just grateful for the things I did receive! First of all, I just want to say please excuse the quality of the photos in this post. I had just gotten out of the hospital and was preparing for a big move so I didn’t really have time to style photos or even do makeup (thus the headless shots). I hope to be getting back to better quality photos soon. Anyway I had ordered this cashmere V-neck midi dress from Everlane back in November because I wanted a warm and stretchy dress. I sized up to a medium to accommodate the growing bump but I feel like I could have gotten away with the small (it just would have been more form fitting). Also because of the bump the midi length gets shortened a little to be just below the knees for me, which I think is a good length for this kind of dress. Without the bump, the dress would probably be more of a true midi length and thus make my legs look stumpier without heels (though the pointed flats of my favorite Everlane Boss Mules helps lengthen the leg a little). So why is this post just a try-on and why didn’t I keep it? In the end I decided that the size was a tad too large and I wasn’t sure I would wear it post pregnancy. Also a dress like this has very limited layering options and it’s just too warm for California winters. If I got overheated in this I would just have to grin and bear it. So as much as I love the look and feel of this sweater dress, the prudent thing to do (especially if I’m trying to keep my closet minimal this year) was to send it back. This might be better for those who have to brave snowy winters and frigid temperatures. Anyway that’s the last Everlane review for awhile since I’m on my one-purchase-a-month resolution now. But I still have some other reviews left from my last December purchases. Also moving away from the clothes-reviewing-posts has helped me come up with some future posts that I think you’ll find interesting and helpful (I hope), so stay tuned for those!